Tired of the bad vibes you have been getting all year long? If it feels like your peaceful life is being uprooted from its core with disheartening news, take a break. Restore the faith with feel-good stories, and find comfort in knowing that there are a lot of good out there, because deep down inside, we all like to go to Heaven, even if some of us don’t believe in it..
Lucky for you we have an ever-expanding series of wonderful acts found on the Internet that will do wonders to your faith in humanity. If you like to see earlier parts of the series, check out our previously published compilations, or if you have a story to share with us, let us know in the comments. If you don’t hold Redditors in high regard, perhaps this story will change your mind. 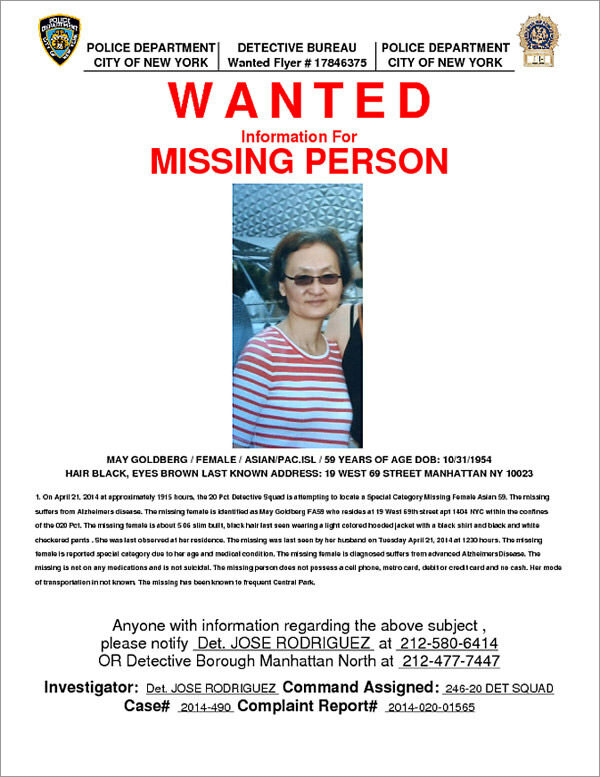 One afternoon in April 2014, Josh Goldberg discovered that his 59-year-old mother, May Goldberg with advanced Alzheimer’s, was missing. Mayhad apparently had walked out of her apartment and didn’t return. After searching and contacting the necessary authorities to no avail, Josh decided to ask Reddit for help. Josh’s mother was eventually found by fellow Redditor geryorama, who had chanced upon Josh’s mother wandering around the street, recognized who she was, double checked her photo to confirm that it was her, then took her to a hotel lobby to contact authorities. He also contacted Josh to tell her that his mother has been found safe and sound. A grateful Josh duly rewarded geryorama for his kindness. Here’s another one about Redditors, only this time they were saving one of their own. What would you do if you come across an actual suicide note online? While you think about that, let me tell you what a group of Redditors did when faced with the same situation. Redditor NotARomanGuy has been suffering from depression for 8 years. He seeked solace by playing Minecraft (as CaesarOctavius) and by contributing to the Minecraft subreddit. But life happens and eventually he couldn’t stand it anymore and one day he decided to take his own life. 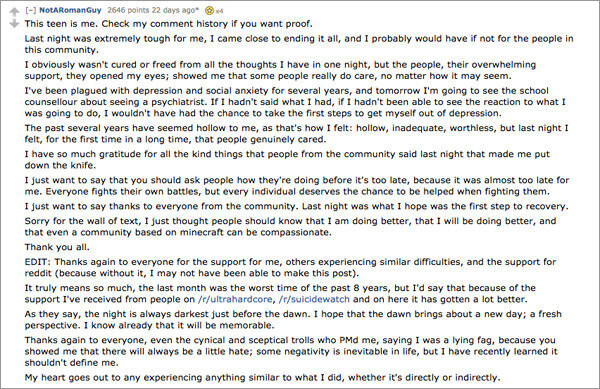 As a farewell to the other Minecraft Redditors, he posted a heartbreaking suicide note on subreddit r/UltraHardcore. Some Redditors recognized the name CaesarOctavius and immediately responded with kind words and anecdotes detailing the good times they had with him. But the support didn’t stop there. 50 other community members joined a TeamSpeak room — which allow users to send voice calls to each other — to talk him out of his plans. There was also intervention by Redditors from the subreddit r/SuicideWatch. And everyone’s efforts paid off. An hour later, this was posted. Ground Zero is a site synonymous with the tragedy of 9/11 that shook the world in 2001. 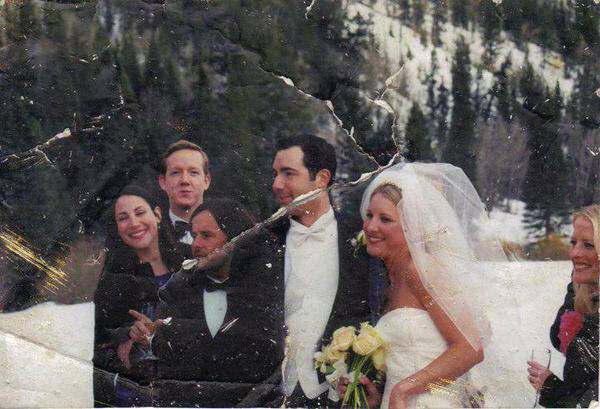 It was also the site where someone found a wedding photo, one that haunted Elizabeth Stringer Keefe for 13 years. You see, Elizabeth had received the photo from a friend, who found it amidst the rubble. Her friend was moving away and had asked that Elizabeth do something meaningful with the photograph. She decided to return it to its rightful owner, in spite of what she might find on the receiving end. Every year on September 11, she would share it on various social media sites. Yet, no one came to claim the photo. Still, Elizabeth persisted. And that persistence paid off when one of the people in the photo, Fred Mahe, came across the retweet by country singer Blake Shelton. Fred went on to thank Elizabeth and was glad to report that all 6 people in the photo are alive. 4. Stand Up To Bullies! This story is one reason why we need to teach kids that all forms of bullying is wrong and not be dismissed as “boys would be boys” or “boys being mean”. … and a kind soul to boot. She decided to cut off her long locks and donate them to Wigs For Kids, which makes wigs for kids with cancer. For her kind act, she got bullied in school on a daily basis, being called nasty names by male students, chiding her for wanting to be a boy, all because she decided to cut her long hair short. Her mother, Heidi approached the principal to take action against the bullies. Instead, the principal told Jetta to just "toughen up". 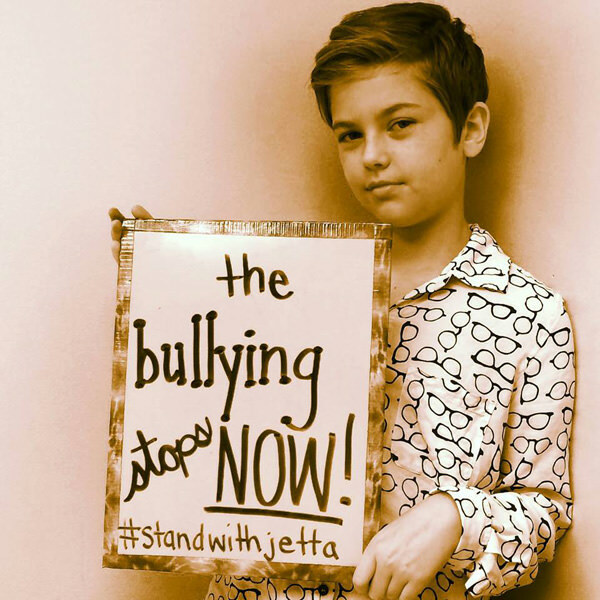 Eventually the bullying took a toll on Jetta, and her mother had to pull her out of school for her safety. Hoping to find support online and to cheer Jetta up, Heidi created a Facebook support page Stand With Jetta, which gained overwhelming support by visitors. Many also shared their personal stories and encounters with the bullies in their life. Her Facebook page also helped spread the word for Wigs For Kids, prompting many young girls to follow in her lead and donate their beautiful hair to those who need it. Betty Musker will celebrate her 104th birthday on Oct 24. She however didn’t want anything, except perhaps a card. 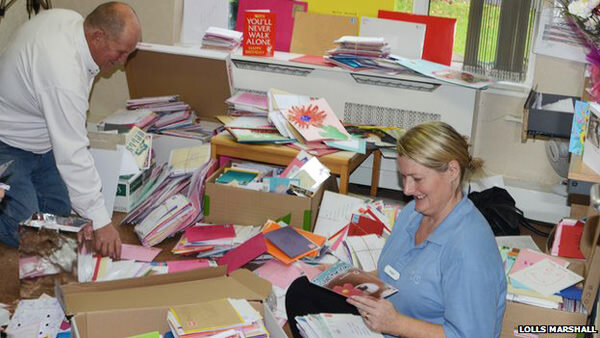 Betty’s family and the rest of the nursing home staff decided to surprise her with as many cards as possible for her birthday, and Betty’s great-granddaughter Vicky Thomas took to work by using Facebook to ask for cards for Betty. They were hoping to get 104, but got a whole lot more. Vicky’s post went viral and cards started to trickle in to the nursing home’s postbox in Warrington, UK. Not only were the cards from all over the UK, they were also from all over the world. There were so many cards that the local post office had to designate a special space for Betty’s cards! When October 24 came around, the staff gathered all the cards they have received to present to Betty, all 5,700(!) of them. 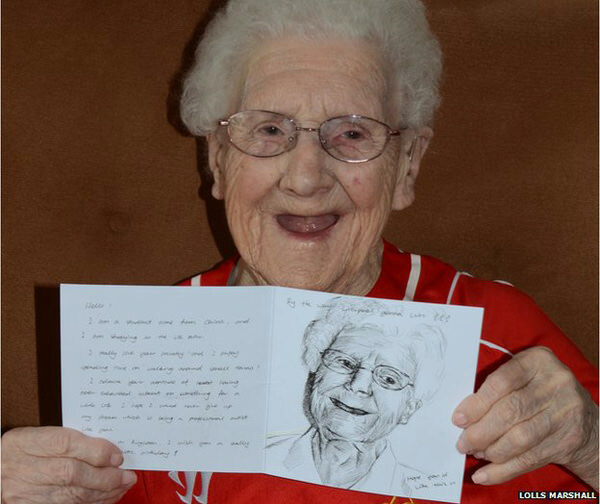 Betty was understandably overwhelmed, and touched that so many “lovely people had taken the time out to send them”. And that, kids, is how you rock a 104th birthday.